Just in from a second go-round of trying out the Les Paul studio series guitars at the local Sam Ash store. We use a variety of session guitarists on projects, I’m normally the bass player but occasionally lower budget clients will hire me as a “one man band” of sorts, including my lead and rhythm guitar skills. I have plenty of acoustics of all types (6 string, 12 string, gut string, etc.) available for tracking at the studio and a great Telecaster and Stratocaster, but I needed a better rock tone. So I headed to Sam Ash and tried the “worn black” Les Paul Studio series on day one. I plugged up to a Marshall stack and ran it through all sorts of riffs, chord sequences and licks all over the neck. It sounded very good. The Burstbucker Pro PAF-style pickups provided plenty of bite. Their out the door price was quoted at $730, Sam Ash web site price: $799. I decided to sleep on it and do more research. Digging deeper, I liked the Alpine White Les Paul 2016 T Studio model with gold trim but it was priced at $1,499 ($1,399 out the door) and it came with 490R & 498T neck & bridge pickups that were getting mostly horrible reviews online. Returning to the store a couple of days later I intended to buy the “worn cherry” version at the $799 price point but thought I’d give the higher priced version a whirl first, just to cover all bases. It was quickly apparent the more expensive guitar had a meatier tone, more harmonic richness, better sustain and, in general, sounded like a Les Paul should sound .It also has the ability to split the coils providing tons of tonal variation. There’s more to a guitar’s tone than pickups but obviously the 490/498 combo are getting a bad rap. They sound great. Better than the much heralded Burstbuckers in my opinion. So I tried the worn Cherry through the same amp and although the tone was very good, it lost in the comparison test. Much thinner, less sustain. The MOX series has the exact same Motif sound engine but less features. Some reviewers on various music sales sites say although the sound engine is identical, processing later in the chain gives the MOX series lesser quality sound. But even those reviewers acknowledged said the sounds were still excellent. “You’d have to A-B compare the Motif and MOX side-by-side to hear the subtle difference,” said one reviewer. Update: 6 months after purchasing the MOX XF6 we are completely satisfied with it. It’s been used on all types of projects and has delivered exactly what was needed every time. We can also add vocals, sax, harmonica, fiddle, violin, pedal steel guitar, guitar, bass guitar and more to your project. For pricing and specific musicians and singers, check out our Nashville Trax web site under the word “More” in the upper right corner. This “review” is a little different than most you’ll read on the CK-7 because we here at Nashville Trax own and actually use one. Most reviews are either verbatim copies of the manufacturer’s sales materials or written by professional writers who tested the product specifically for the purpose of writing a review. As a studio owner and music producer in Nashville, TN this review is based on my experience over the last six years. Here’s the link to the ZZounds page where you can buy one if you like, I’m making no money from ZZounds if you do so. The bottom line is the CK-7 is a great microphone, although the applications are somewhat limited; in those applications though, it excels. It’s listed on ZZounds as a vocal mic and for most studio vocal use it would be far better for vocals than, say, a dynamic like the SM 58. But there are many other large diaphragm condenser mics that I’d choose over it for vocals, even in that same basic price range. The sound of the CK-7 is a little gritty on male vocals which could be a good thing sometimes but I’ve had no use for it at all for female vocals, in A-B comparison tests it’s never once won out on a female singer. Where this mic has excelled is on acoustic instruments. It’s sensational for acoustic guitar and just as good for fiddle, banjo and mandolin. In combination with a good pre-amp, it can’t be beat. More than one Nashville session quality acoustic musician has remarked that no studio achieved a better sound on their instrument, thank you CK-7! A good acoustic guitar sound can be achieved with the CK-7 placed a few inches away from the guitar neck around fret 12. For most acoustic instruments you’ll want to use the mic’s roll off switch to eliminate some of the low frequencies. In most situations you’ll likely prefer the unidirectional setting. Before we start the review of the FMR Audio RNC 1173 I want to mention the new service available from Nashville Trax Recording Studio for people who produce their own recordings at home as well as for commercial studios who have clients that need session quality musicians and singers. Nashville Trax offers session quality custom tracks you can easily add to your project: drums, bass guitar, guitar, violin, cello, mandolin, piano, synthesizer, Hammond B3, lead vocals, background vocals, harmony vocals, harmonica, sax, flute, you name it! Here are a few of the vocalists available. Or how about bass guitar? For the other options simply go to the main Nashville Trax site and click on “More” in the upper right corner which will open all the various instrument and vocal options as well as mixing and mastering services. The 1173 is interesting because it’s designed by a husband and wife electronics operation whose philosophy is “put money into components, not packaging.” They also have incorporated a proprietary “cascading compression circuit” they call “Really Nice” mode, that can be switched into and gives controllable compression that builds incrementally as the signal passes through each stage. When I say little, it’s little! It can just about fit in the palm of your hand. It compresses signals. If you’re not into electronics the best way to explain that is when you record a sound source, guitar, fiddle or whatever, it can be uneven in volume. Compression raises the lowest amplitude sections and squashes the peaks resulting in a more even, more easily controlled sound. Tests: It’s not pretty, it’s not all that sturdy but it’s easily the best “under $600” compressor I’ve used and the cascading stage is liquid. It’s already aced a test on fiddle, snare and bass guitar. It does a decent job on vocals, but if that’s your principle application and you can afford to go above $600, keep looking. Why mess with a cheap compressor with a $2,500 Avalon and other more expensive outboard, as well as software based, compressors available? Because it’s not about money, it’s about sound! I’m keeping it! It won’t be my go-to unit and if it’s your first and only compressor you’ll replace it someday but I think this is a good tool to add to your bag of tricks. Sometimes cheapest sounds best. You never know until you try it!- b.e. We offer crazy low rates on mastering. For a limited time it’s only $75 per song with no minimum number of songs. 3 songs or more? Only $55 per song! Look through your old CDs and files and see if there’s anything you’d like to have done! Have you ever seen a price on mastering under $100 per song? This is full blown mastering well under $100 per song provided the song is under 6 minutes long! Give us your.wav or MP3 file. We’ll return a .wav or mp3 stereo master file (your choice). For those who aren’t sure what mastering is it involves taking the mixed track, reloading it into mixing software and adding EQ, effects, compression and more to the entire stereo mix. The end result is cleaner and punchier. The vocals have more clarity and width. There will be more depth to the mix. 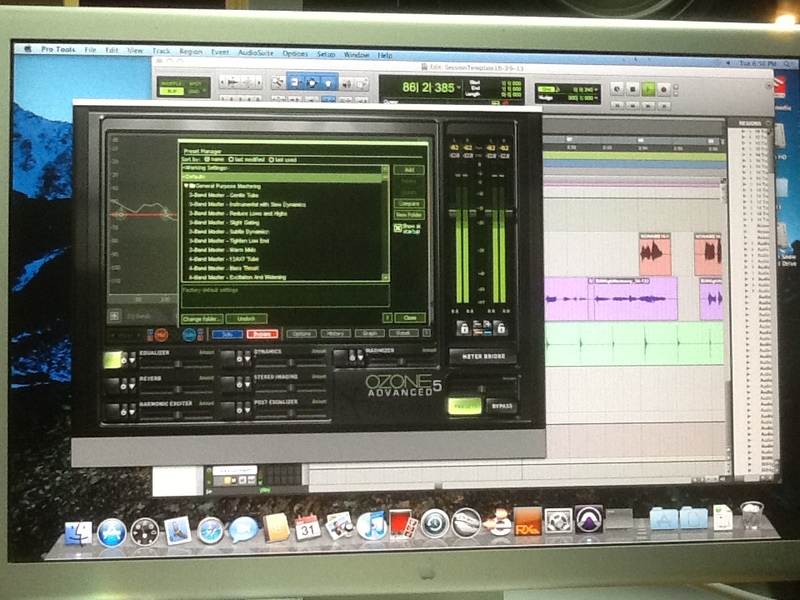 Basically, after mastering it meets radio airplay standards and it just sounds better! Want Great Translation In Your Mix? Event ASP8 Studio Monitors Get It Done! Notice the reflections on the face? The fronts are polished like mirrors. 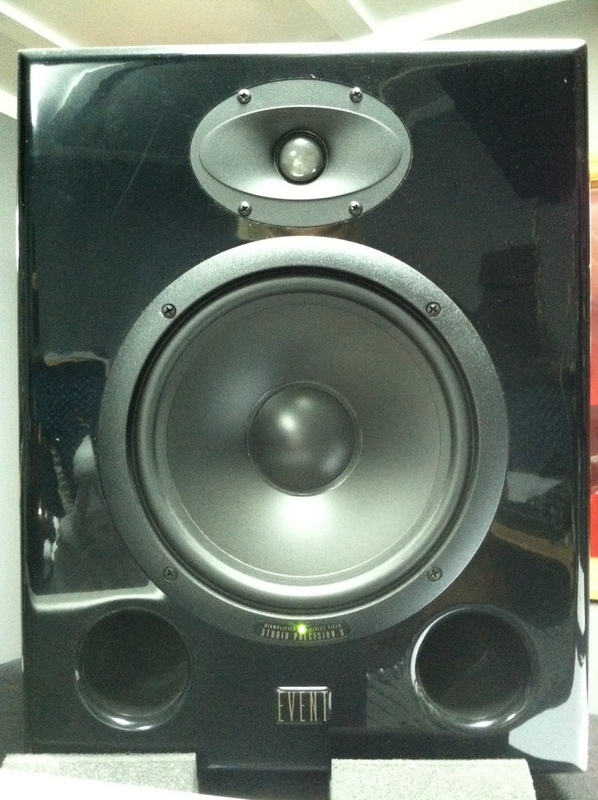 Event ASP8 Studio Monitor. You could shave with this! We also have a set of JBL’s with a switch to toggle between the Events and the home stereo quality JBLs. This assures that you mix will sound as great at home, as great on your computer speakers, as great in your car stereo, as it does at the studio.